Well, technically, the German, Swiss and French countryside. But since we were in Germany for all of about a mile – it was mostly just the Swiss and French countryside. After leaving Eurobike on Friday, we meandered up to Zurich that evening. Since it was a full day at the show, we didn’t actually get off the boat in Constance until 8PM, so we ate dinner there before deciding to drive roughly an hour to Zurich. We figured it was an easy place to get a hotel for the night before our drive the next day. We spent the majority of Saturday wandering around Zurich. Though, I don’t really have any photos from that adventure. Sorry about that. It was pretty though, and the tiny town we stayed in was equally quaint – especially when we woke up in the morning and it had stopped raining. From there we planned a short 45-60 minute drive up to the Orient Forest Regional Park, which is a fairly substantial two-lake recreation area. Each lake is probably about 7-8 miles in length, and a mile or so wide. The goal of our time there was to get in a nice Sunday workout, as well as get a ton of product review shots down for a bunch of products that required either open space, or open water. Despite our home in Paris being all of a dozen yards from the Seine, swimming in the Seine at our location is apparently frowned upon. First though, our normal workouts. Today I went the route of the Joule GPS and the Polar RC3 GPS. Both of which are the next GPS units up for review (Preemptive answer: The Garmin Fenix review will be put together once I’ve got the final firmware, and the final hardware). We only had scheduled about 1 hour 30 minutes for our respective workouts. She went off on a run, and I selected to ride. 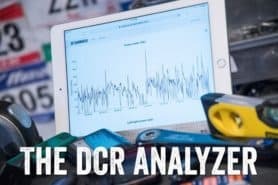 This also allowed me to get some solid comparative data between the different power meters I had on (Power2Max, PowerCal, PowerTap). The ride itself was quite nice. The lake features both a path as well as a quiet country road around it. Like most places, more casual cyclists were using the path, and more serious ones the road. Since there was virtually no traffic, I didn’t have much to worry about. Around the other side of the lake folks were getting in their final doses of summer at the beach. It cools down here much sooner than in DC. At this point in DC you can still get a nice hot 100*F day, whereas here we’re down to the 70’s. After wrapping up our rides and runs, we grabbed a slew of products and camera gear and set out for over two hours of shoots and tests. Up first were the Swim It and Kiefer Safer Swimmer devices. I’d gotten a number of requests to review these products since my posting about the Swim It back a few months ago. Note that they are very different products – one is designed to save your life in the event of an unforeseen situation (Swim It), while the other is designed to keep a boat from hitting you. 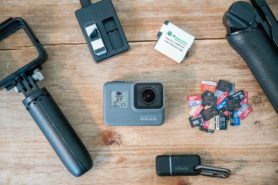 We got tons of good shots from close and far, as well as put together a video showing the triggering of the Swim It device. I learned a lot from it, and look forward to posting about it next week (plus, my video editing skills are…well…’improving’). Again, more high production cost (free) video editing coming your way soon! Probably also next week. You get to see me jump out of the water onto a dock, and my whole transition run-through. Good times. Actually, we had really wanted to include some sweet aerial video footage of the transition demo I put together. I had picked up this awesome little quadricopter (four bladed helicopter, Parrot AR Drone 2, controlled via iPhone) which includes an HD camera inside (of so-so quality). We had done some test runs in the day before, with The Girl getting the controls all figured out. Things were going fairly well in fact. From there, it was back home to Paris, weekend complete! Wow…..I’m exhausted just reading about all your travels. Great adventures! Thanks for all the insight into Eurobike. That mobile looks nice. Tiny and android. Is it good? 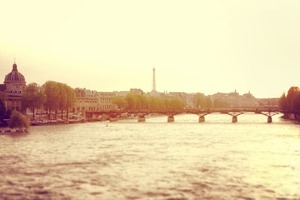 We’re moving to Paris… tomorrow! Yup, that’s right, we’re packing up shop and moving over to the land of …. and of chocolate macaroons! Actually, rather, we’ve already packed up shop – over three weeks ago. The stuff is slowly plodding it’s way across the Atlantic (just off the coast of Newfoundland as of tonight). Last week, we showed you our final apartment selection with the House Hunters style series. However, getting all of our stuff into our apartment was probably even more fun. Going to the farm and picking fresh produce! 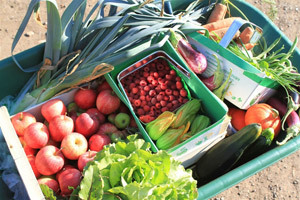 One of the things we both really enjoy doing is going to u-pick farms and picking our own fruits and vegetables. In the past, we’ve primarily picked apples, blueberries, and strawberries. Given it’s fall (crazy, huh? ), we figured it was time to go out and pick some apples. Let’s make this clear up front – Paris is nowhere near a beach. The closest oceanesque body of water with sand is roughly 200 kilometers away – and the water there isn’t terribly warm either (the nice stuff is down south). 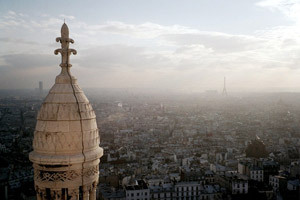 So what do the Parisians do in the hot summer months (aside from close up shop and leave)? 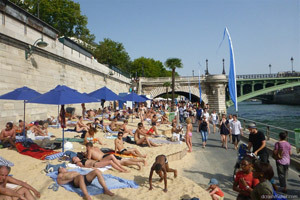 They truck in a boatload of sand and setup a beach right in the heart of Paris on the Seine. Are you coming to Paris? 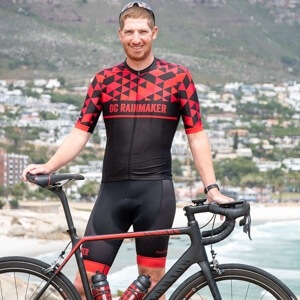 Looking for places to swim, bike and run? Or just simply want to see where I swim/bike/run? Well, here’s the skinny on all my favorite training locations – complete with maps and downloadable routes.